Poklong Anading's Urban Canyon is a succinct compilation of related projects that draw our attention to the marginal structures of the city. The city - not necessarily built but conceived - is in reality the construction of hidden edifices that contain its true meaning. 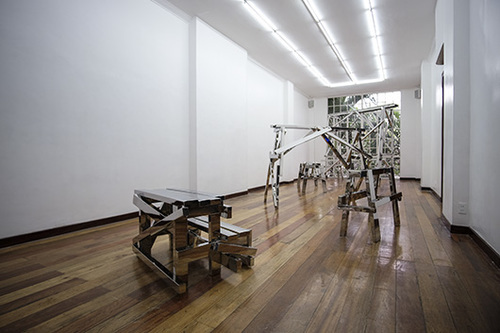 Our sense of city, which for Poklong Anading is nothing but a complete re-fabrication of its "inner workings", rely heavily on structures that evoke certain metropolitan and cosmopolitan ideals that only cast out its many ironies and - as a case for argument - conceal the many sources that define its real character. 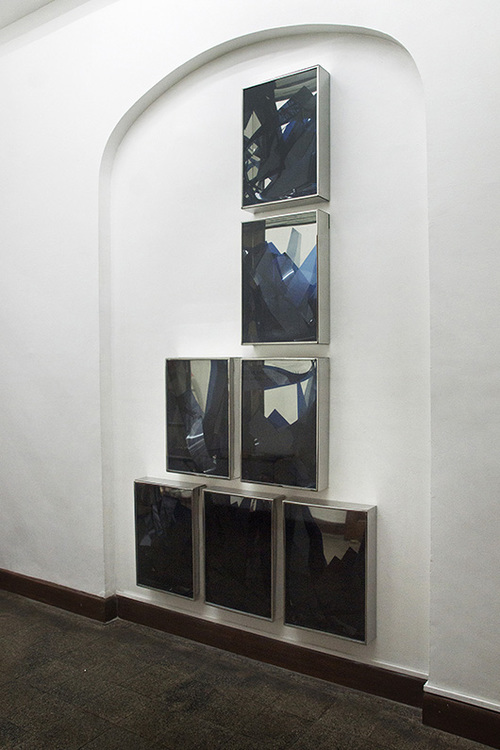 Four series of projects are exhibited in the show, namely, Road to Mountains, Untitled (Drawer), Homage to Homage, and Gateway. These works present different strategies for unveiling the urbanscape's lost components through photography, collage, video, sculpture, and through the very use of the gallery space as a discursive platform in re-situating an object from its city-function. These lost components are the "repressed" concepts of the city: buried, forgotten, or annihilated from the panorama to make way for our new sense of the city. One could also argue, that these objects constitute the base while the superstructure lies in the forces that relish their disappearances in a consumerist/corporate world. In Untitled (Drawer), the once imposing sight of tower cranes against the skyline are salvaged from their great disappearances through the accumulation of their images in clear film photographs. A variety of these photographs are slipped inside steel boxes with glass panels, which adds layer upon layer of cranes, likening its buildup to the formation of a collage as it randomly fills the frame. A tower crane's presence and volume becomes inversely proportional to the skyscraper's during construction. The moment the skyscraper reaches its completion is the moment the tower crane disappears. Their collapse into oblivion is the collapse of our memory as they are replaced by the new structure, and is recorded inside Anading's boxes of steel and glass. Another object which is valorized against its disappearance is found in the work, Homage to Homage. The lowly andamio - the makeshift scaffold for the local carpenter to use - is wrapped by Anading in stainless steel to celebrate its ad hoc nature, which embodies the essence of its form. These objects, which are necessitated into existence for the purpose of aiding the construction of another form (a part of a wall, a house, or a building) disappear against the realization of a more refined and ideal architecture. But the andamio's form - arrived at with exigency, in random fashion, in a multitude of shapes and sizes, and in odd formations to guarantee its sturdiness - as already a contradicting sight to behold, is enveloped further in such luster to signify the enigma of their presence, and ultimately - their disappearance. 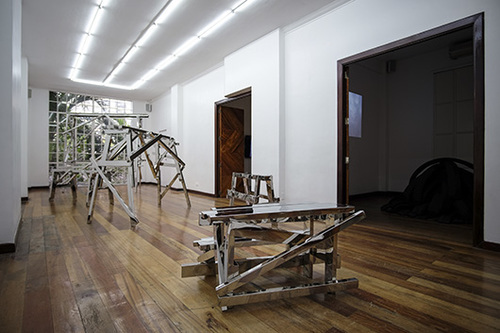 In the work, Road to Mountains, an odd phenomenon of the city attains a unique presence inside the gallery. Levelled and stretched-out rubber tires that were used as speed bumps are re-situated inside the gallery space and are re-organized to highlight their contradictory nature: when the medium for motion also becomes the medium to suspend motion. 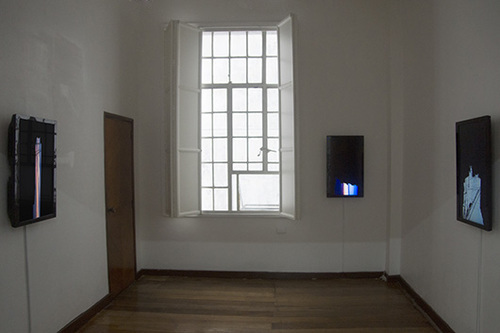 Accompanied by photographs of their different configurations in actual city roads, and a single-channel video which depict the paradoxical nature of progression against these speed bumps, this project of Anading exposes the contradictions of city life, as well as the mutability of an object's function in art. Gateway, is a video in three parts conducted from three different cities: Singapore, Manila, and La Rochelle in France. In this work, Anading explores the borders that define a city. Through the camera lens and into the realm of imaging software that allows him to reconstruct the scene, the different surfaces are polarized into opposites: structure and sky, silhouette and light. As the shape drawn against the skyline is illuminated to form a new edifice, they are re-positioned inside the frame to realize monuments of their own. Through these images, the horizon is isolated, but in doing so it signals the opposite: of how it slowly disappears from our view, and how the base is thrust deeper and deeper against the blockade of rising structures, forming urban canyons that transform the whole cityscape. In Poklong Anading's series of works, the viewer is led to ask, what are lost within the structure? And what continually takes its place? Through the ingenuity of his art and through his inimitable vision, he continues to involve himself within the conversation by persistently searching for these forgotten urban artifacts while constantly addressing the ramifications of the perceived city-structure.